The first 12 days of the 2017 legislative session have flown by, and I wanted to take a minute to provide you all an update from my office about all of the activity here at our Unicameral. As you know, the legislative session began on Wednesday, January 4th when I and 16 other freshman senators were sworn in to office. I was assigned to the Appropriations Committee, which is responsible for allocating funds to our state government. I also serve on two special committees: the State-Tribal Relations Committee and the Legislature’s Planning Committee, where I was elected to serve as Vice Chair. 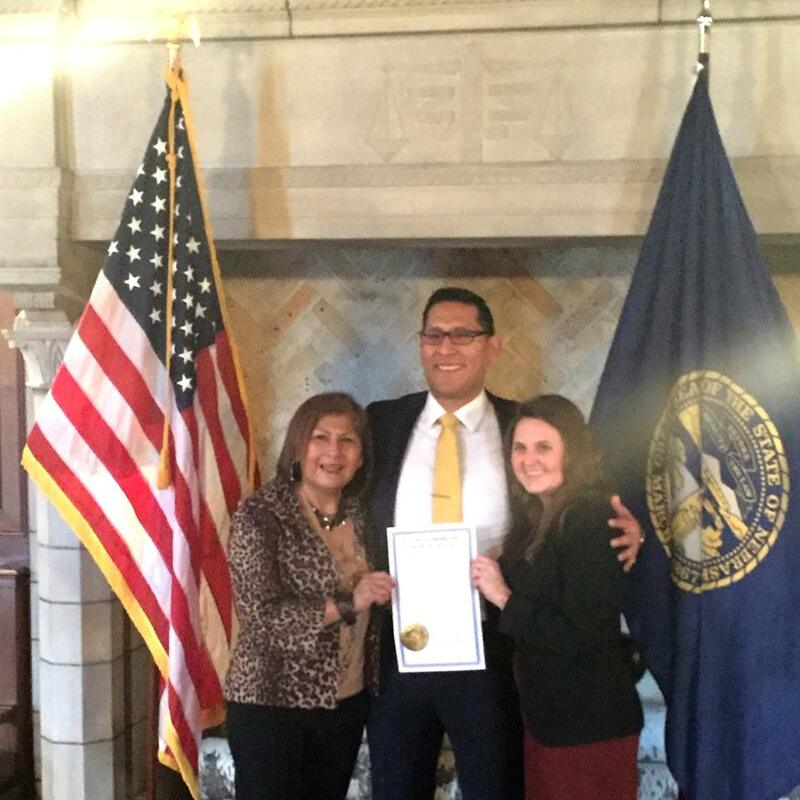 With my mother, Lidia, and my wife, Lauren, after being sworn. LB163 – Expand Early Vote Locations: Requires counties with more than 100,000 to open at least three early vote locations and extends hours of operation. LB194 – Regulations on Payday Lenders: Protects consumers by capping interest rates, fees, and monthly payments for borrowers. LB272 – Historic Tax Credit Approval: Requires the Department of Revenue to complete project audits and issue a tax credit within 60 days of application. LB290 – Automatic Voter Registration: Modernizes voter registration to sync with eligible applications at the Departments of Motor Vehicles, Education, and Health and Human Services. LB352 – Wind, Solar, and Fuel Cell Project Approval: Requires the Department of Energy to develop an online application for wind, solar, and fuel cell projects. LB416 – Funding for Bilingual Department of Labor Inspectors: Transfers $250,000 of existing funds to be used to hire bilingual inspectors for misclassification investigations. LB427 – Breastfeeding Accommodations for Students: Requires schools to provide milk expression and storage facilities for student mothers. LB428 – Absence Policy Accommodations for Student Parents: Directs school districts to develop and implement an absence policy that accommodates student parents. LB533 – Require Insurance for Drilling and Fracking Activity: Requires companies involved in drilling and fracking activity to carry a $5 million liability insurance policy. LB534 – Support for Behavioral Health Housing: Provides funding for a statewide housing coordinator to support regional behavioral health districts. Keep checking back on my website for information about this legislation as our session moves forward. I am also hosting two events in the district later this month and I hope to see many of you there. Saturday, January 21, 2017 from 12:00 p.m. to 3:00 p.m.
Saturday, January 28, 2017 from 1:00 p.m. to 3:00 p.m. I am so proud and honored to serve our great state and look forward to hearing from you soon.